Experience self-guided scenic drives. 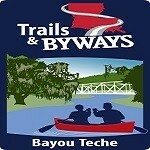 The Bayou Teche and Jean Lafitte Scenic Byway drives wind through the heart of Cajun and Creole country, inviting visitors to taste the culinary culture of a land steeped in rich heritage and people who never meet a stranger. Guides available at Iberia Parish Convention and Visitors Bureau.